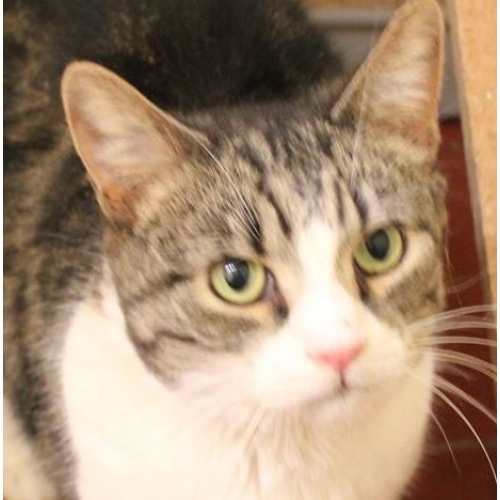 Blossom originally came to us nine years ago, when she was dumped with her kittens. We found her a home, but sadly the lady passed away a few years later. We found Blossom another home, but after a while she decided she didn't like the other cats in the house, so she is back with us again. This poor girl has been backwards and forwards, and needs somewhere to settle for the rest of her life. Blossom is overweight and on a diet. She has wheezy breathing and often sneezes, this has been examined by a vet and treated with antibiotics and steroids, with no improvement, and the vet's further suggestion of giving her a general anaesthetic and putting a camera up her nose was considered too invasive for an elderly cat. She is fully vaccinated and has lived with other cats without passing the condition on. It's a bit of a mystery, but does not cause her trouble day to day.